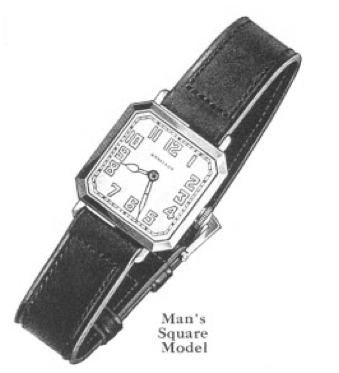 The 1926 catalog was pretty simple from a men's wrist watch standpoint... there were only two choices, the Cushion and the Square. Strap watches for women had been around a while but men's versions were "new". Both watches used the 17 jewel, 6/0 sized 986A movement without a second hand. Cases were gold filled or solid gold, in green or white gold. Only luminous dials were available. 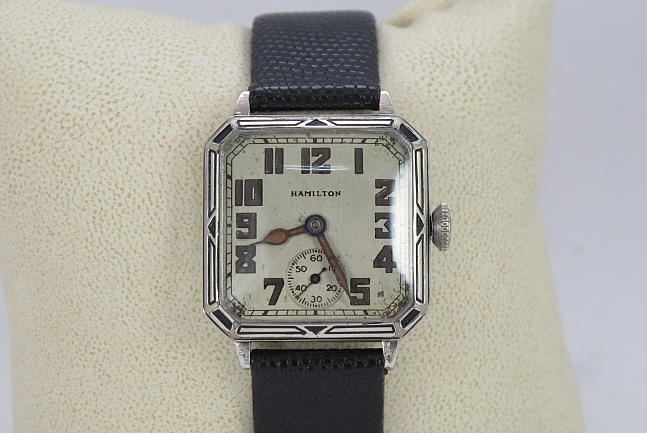 Then, in 1927 Hamilton introduced the 6/0 sized, 17 jewel 987 movement with a sub second hand. The movements have slightly different dimensions so the cases for a 1926 Square is slightly different than a 1927 Square (cut corner) case - and each is intended for it's specific movements (you will sometimes see them get mixed up). The 1927 Square (Cut Corner) was also available with plain or engraved bezels. The 1927 catalog also introduced the Barrel to the "geometric" model lineup. The Tonneau joined the geometric lineup in 1928. The Square continued to be produced through 1930. I believe (and could be mistaken) that some 987's made it into the earlier Square cases and the case backs are marked "987" to denote this difference. 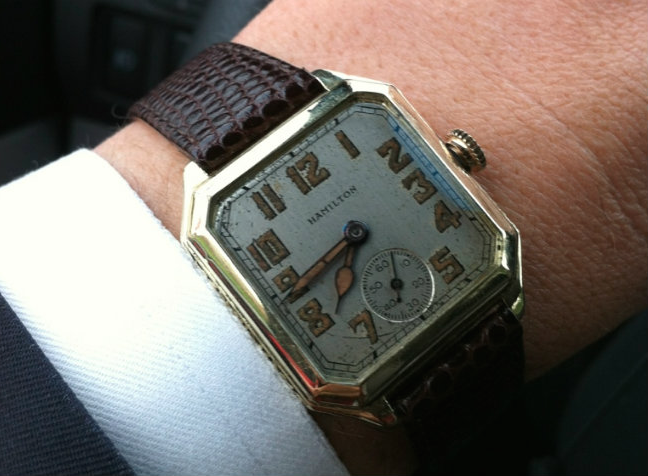 Here's an example of the 1926 Square with an engraved bezel. This varient is called the "Enamel Inlaid Square" and can be distinguished from the later Square Cut Corner by the shape of the center section of the case as well as the lugs. The engraving pattern is also unique to the "Enamel Inlaid Square". This is a relatively uncommon watch is rarely comes up for sale. And heres a few shots of Engraved and Plain Squares (Cut Corner)... although the bezel is plain on the Plain model, the center of the case is still engraved. Note the protrusion of the center part of the case, especially near the lugs. Really like the late 1920s/early 1930s designs - very 'Boardwalk Empire'. Was the 987 one of the longest produced Hamilton movements? That's a great question. I suppose it depends on what you mean by 987. 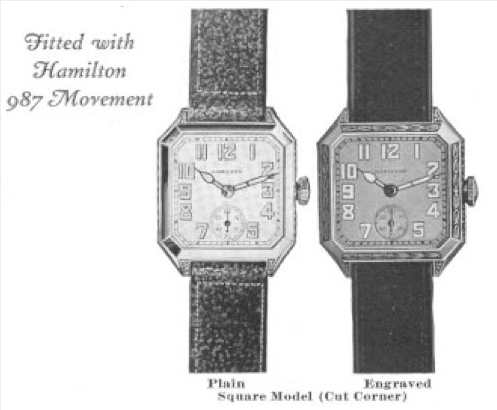 Hamilton didn't seem to differentiate the various 987 movements in it's marketing literature but the grade did evolve significantly over time. To Hamilton it was always just "the 987 movement". But in reality there's the 987 (1926-1930), then the 987F (1930-1934), then the 987E (1934-1937) and finally the 987A and 987S (1937-1948). My dates are estimates and not based on actual production stats. The five variants share a lot of common parts but the latter two are very different than the first three. It's not unusual to see a 987 when you'd expect to see a 987F or to see a 987F when you'd expect to see a 987E - as inventory produced earlier could be used later. It doesn't alway go well the other way though... for example, you wouldn't expect to see a 987E in a 1928 Cushion. You certainly wouldn't expect a Cushion with a 987A - even though it would fit fine. The 14/0 movements (980 and 982) enjoyed a production run from 1935 to 1952 but were interrupted by WWII. There where slight modifications to jewel settings, set lever springs, demaskene patterns, etc. over time but for the most part the movements are largely unchanged. Then you have the 12/0 sized 770 movement that came out in 1957 (I believe) and was produced through 1969... a pretty long, uninterrupted run. Had American production not ceased in 1969, I suspect it would have kept on going - as it was viewed as the finest movement Hamilton ever made. In the end, I guess my money would be on the 980 and 982 for longest produced Hamilton movement. Thanks for the excellent reply Dan. It is interesting to wonder whether Hamilton would have phased out the 987 sooner if the A/S weren't required for war production? Loving the blog and look forward to your posts.. Whilst forcing myself away from the sales! Keep up the great work. Anyone know of a source for hands? These will work - but you'll have to relume them. Hi Dan, and greetings from Edinburgh, Scotland. 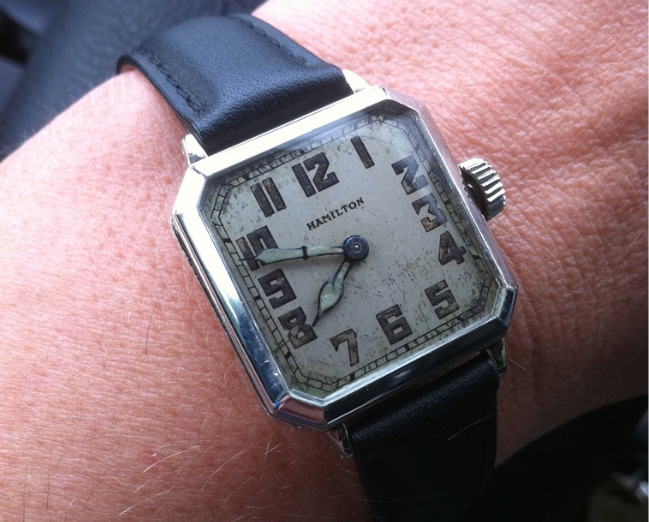 At last I have found a photo of a Hamilton watch that closely resembles my one. My watch is a 987F movement, and is 14ct white gold infilled(corner cut). The differnce between my watch and the photo of the one on your wrist (3rd photo down) isnthat mine is engraved fully around the bezel, and the second-hand dial numbers interrupt the second markers - there are only 3 showing per 5 second measurement. Alo, the numbers on the dial are the same colour as the dial. I intend to have my watch serviced and begin wearing it again, but need a main spring. Do you know of where I could access one? Regards for a great site. 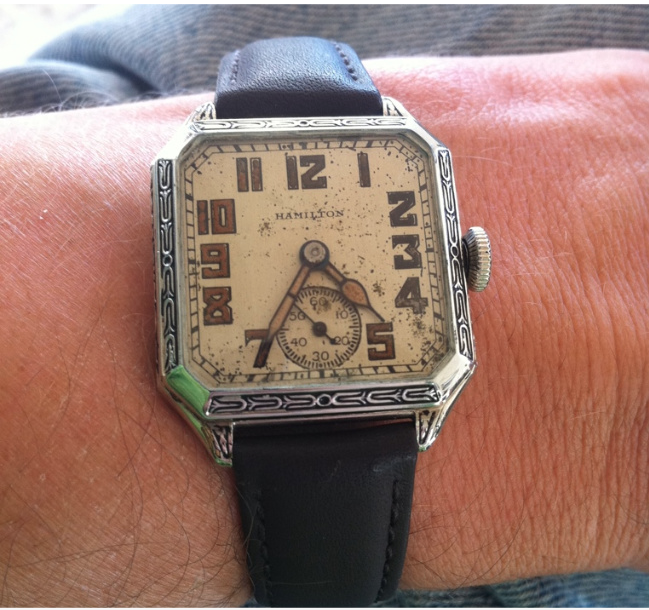 Dan, your image of the Square (4 pictures up from the bottom) is described as, "... an example of the 1926 Square with an engraved bezel. This varient is called the "Enamel Inlaid Square" and can be distinguished from the later Square Cut Corner by the shape of the center section of the case as well as the lugs." Is this a 1926 model or a 1927? From what you told us the 1926 model has no sub second hand. The image is of a watch with a sub second. 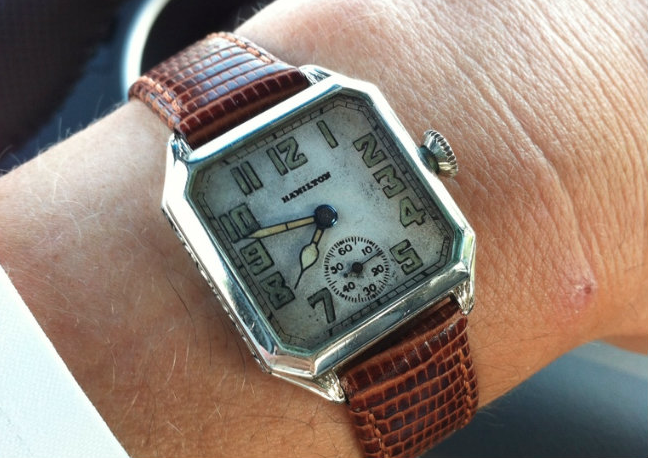 You did write that this particular watch is a rarity but is it a 1926 model or a 1927? It's a little confusing to answer but there are two cases, a first generation version and a later second gen version. The earlier version housed the 986A without a second hand and possibly a few 986 movements with a second hand at 9. The first generation case is shown in the 1926 catalog but I think the catalogs were like model years of cars... next year's models came out before the end of the year. The 987 was shown in the 1927 catalog but I believe a few hundred were produced toward the end of 1926 so there were some 987's in the calendar 1926 year. You can tell a second generation case by the way the center section extends past the bezel. Anyway, the Enamel Inlaid Square is a much less common model and it uses a 987 in the first generation-style case with the bezel engraved as shown. Hamilton's production notes say that the 987 will not fit in the early 986 and 986A case and the 986 / 986A will not fit in the 987 case. So there must be something special about the Enamel Inlaid Case to allow the 987 to be used. Dan I have a 26 yellow filled case with the sub second hand. The case back is stamped 987 it looks original and I am confused? Could it be a very late 26? Or am I an idioI ? Thin non engraved center section. The cases for a 987 movement are slightly different than for an earlier 986 movement. So the case back is stamped 987 when the two were being used. The last four numbers of the case serial number should be stamped on the back of the case center section, indicating they are a paired set. The bezel has scratched numbers inside that should match too but not quite roman numerals (like 4 is IIII and not IV).